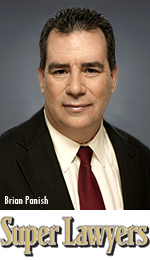 In the recent 2011 Southern California Super Lawyers publication, Panish Shea & Boyle LLP partner Brian Panish was named among the Top Ten Super Lawyers in Southern California. He received the second highest number of points overall and the most points by an attorney specializing in personal injury cases. Brian Panish’s verdicts include the largest personal injury verdict in United States history, $4.9 billion in Anderson v. General Motors, and two of the largest personal injury verdicts in California history, $58 million in Griggs v. Caterpillar and $55.4 in Lampe v. Continental Tires. All firm partners were named as 2011 Super Lawyers. Adam Shea is recognized as one of Southern California’s Top 100 lawyers and as a Super Lawyer in the area of Plaintiff’s personal injury cases involving products. Kevin Boyle is named as a Super Lawyer in the area of general Plaintiff’s personal injury cases. Super Lawyers selects attorneys for its publication on an annual basis using a three phase process, including the development of a candidate pool; the evaluation of candidates based on professional achievement and peer recognition; and peer evaluation by practice area. The final selection of Super Lawyers includes no more than 5 percent of the lawyers in the state. Brian Panish, Adam Shea, and Kevin Boyle have been consistently recognized as Super Lawyers in the personal injury practice area over the years. Panish Shea & Boyle LLP specializes in representing Plaintiffs in catastrophic injury, wrongful death, products liability, and mass torts litigation. Firm attorneys have obtained more than 300 verdicts and settlements in excess of $1 million, including 16 verdicts and settlements in excess of $10 million paid in the last 5 years.